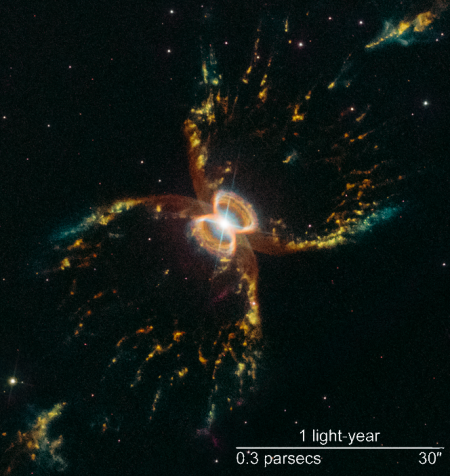 In celebration of the 29th anniversary of the launch of the Hubble Space Telescope, the Space Telescope Science Institute (STScI) that operates the telescope has released a new image of one of the more spectacular astronomical objects in the southern hemisphere, what astronomers have dubbed the Southern Crab Nebula. I have cropped and reduced the image slightly to post it to the right. The nebula, officially known as Hen 2-104, is located several thousand light-years from Earth in the southern hemisphere constellation of Centaurus. It appears to have two nested hourglass-shaped structures that were sculpted by a whirling pair of stars in a binary system. The duo consists of an aging red giant star and a burned-out star, a white dwarf. The red giant is shedding its outer layers. Some of this ejected material is attracted by the gravity of the companion white dwarf. The result is that both stars are embedded in a flat disk of gas stretching between them. This belt of material constricts the outflow of gas so that it only speeds away above and below the disk. The result is an hourglass-shaped nebula. The bubbles of gas and dust appear brightest at the edges, giving the illusion of crab leg structures. These “legs” are likely to be the places where the outflow slams into surrounding interstellar gas and dust, or possibly material which was earlier lost by the red giant star. Hubble first revealed this nebula’s shape in a photograph taken in 1999. The telescope was initially designed for a fifteen year mission. It is about to double that, assuming its last remaining gyroscopes can hold on through next year. The main camera on the Hubble Space Telescope has resumed science operations after going into safe mode last week. At 8:31 p.m. EST on Feb. 28, the Advanced Camera for Surveys aboard NASA’s Hubble Space Telescope suspended operations after an error was detected as the instrument was performing a routine boot procedure. The error indicated that software inside the camera had not loaded correctly in a small section of computer memory. The Hubble operations team ran repeated tests to reload the memory and check the entire process. No errors have been detected since the initial incident, and it appears that all circuits, computer memory and processors that are part of that boot process are now operating normally. The instrument has now been brought back to its standard operating mode for normal operations. From the press release, it appears that they have not been able to trace why the error occurred. However, much like a typical Windows computer, after a mysterious crash and reboot now all appears well, so they have shrugged their shoulders and moved on. The main camera on the Hubble Space Telescope has suspended operations, and remains so as engineers troubleshoot the problem. According to NASA, at 8:31 p.m. EST Feb. 28 (01:31 GMT March 1), 2019, the Advanced Camera for Surveys, or ACS, suspended its operations when an error was detected while the instrument was performing a routine boot procedure. “The error indicated that software inside the camera had not loaded correctly,” a statement from NASA reads. “A team of instrument system engineers, flight software experts and flight operations personnel quickly organized to download and analyze instrument diagnostic information. They have not yet pinpointed the cause of the problem. The telescope has other cameras, however, though one of which had problems several months ago. It is ten years since the last shuttle repair mission. That mission was expected to extend the telescope’s life for five years. Thus, the end Hubble’s life is getting closer and closer. 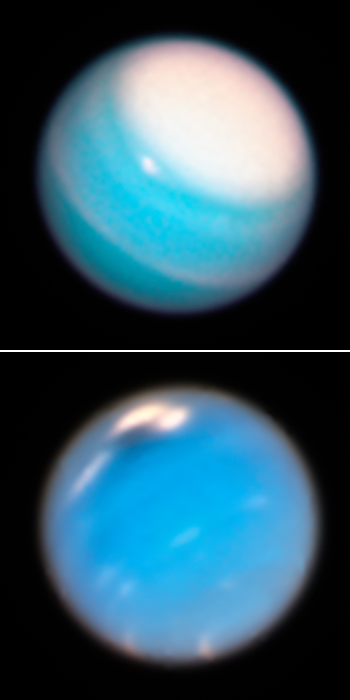 The Hubble Space Telescope’s new annual images of Uranus (top) and Neptune (bottom) has revealed new atmospheric features for both, a giant north pole cloud cap on Uranus and a new dark storm developing on Neptune. The snapshot of Uranus, like the image of Neptune, reveals a dominant feature: a vast bright cloud cap across the north pole. Scientists believe this feature is a result of Uranus’ unique rotation. Unlike every other planet in the solar system, Uranus is tipped over almost onto its side. Because of this extreme tilt, during the planet’s summer the Sun shines almost directly onto the north pole and never sets. Uranus is now approaching the middle of its summer season, and the polar-cap region is becoming more prominent. This polar hood may have formed by seasonal changes in atmospheric flow. The images are part of an annual program that monitors both planets with images every year when the Earth is best placed to view them. This allows scientists to track atmospheric changes over time. 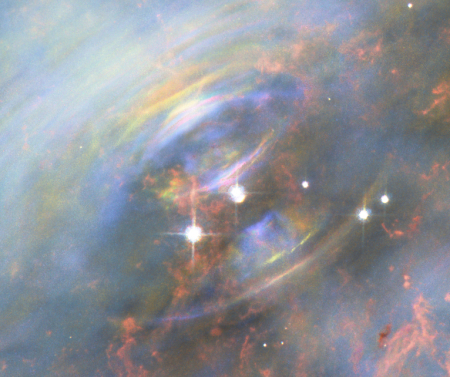 The sharpness of both images matches that of previous Hubble images, so these photographs do not show any decline in the telescope’s image capability. However, when they lose that next gyroscope and shift to one gyroscope mode, I believe it will be very difficult to get images even this sharp of the outer planets. In fact, I suspect this monitoring program will likely have to end, or will be badly crippled. Engineers have identified the issue that put the main camera of the Hubble Space Telescope into safe mode last week, and expect to have the camera back in operation in two or three days. Hubble’s Wide Field Camera 3 (WFC3) took itself offline last week as a safety precaution, after onboard software noticed anomalous voltage readings within the instrument. But Hubble team members have now determined that voltage levels actually remained within the normal range, ascribing the glitch to a telemetry issue rather than a power-supply problem. The mission team reset the relevant telemetry circuits, gathered some more engineering data and then brought the WFC3 back to an operational state. “All values were normal. Additional calibration and tests will be run over the next 48 to 72 hours to ensure that the instrument is operating properly,” NASA officials wrote in a Hubble update Tuesday (Jan. 15). None of this changes the reality that it is almost a decade since the last shuttle repair mission, and Hubble is facing a long slow decline leading to its eventual loss, with no replacement planned by anyone. The coming dark age: The Wide Field Camera on the Hubble Space Telescope has experienced “an anomaly” that has forced its shut down. The announcement is a mere one paragraph long, and provides no further information. This camera was installed on the space telescope during the last shuttle mission in 2009. It is now almost a decade since that mission, which was expected to extend Hubble’s life for at least five years. It is therefore not surprising that things are beginning to fail. In October they had a serious gyroscope problem when a gyroscope failed and they had problems getting their last back-up gyroscope to work. They got it working, but this has left us with a telescope with no gyroscope backups. With the next failure they will have to shift to one gyroscope mode, meaning sharp images will no longer be possible. Now the main camera has shut down. Unfortunately, it appears that we are reaching the end of Hubble’s life span. The sad thing is that this shouldn’t be necessary. It can be repaired, but this would require a robot mission, something that would have been very difficult a decade ago but is quite doable at a reasonable cost today. No such mission is being considered however. Even worse, the bad planning that is routine for our modern intellectual class has left us with no replacement, for the foreseeable future. In the late 1990s the astronomy community chose this path, deciding to replace Hubble with an infrared space telescope, the James Webb Space Telescope. They and NASA also decided to push the limits of engineering with Webb, resulting in a project that is about a decade behind schedule with a budget that has ballooned from $1 billion to $9 billion. Meanwhile, there has been no money for any other major space telescopes. And the one the astronomy community proposed in 2011, WFIRST, is already over budget and behind schedule, in its design phase. The astronomy community has also decided in the past two decades that it could replace Hubble with giant ground-based telescopes, a decision that has so far proven to be problematic. Though adaptive optics can eliminate some of the fuzziness caused by the atmosphere, it limits observations to very narrow fields of view, meaning it cannot obtain large mosaics of big objects, such as this Hubble release earlier this week of an image of the nearby Triangulum Galaxy. Moreover, almost all of the giant ground-based telescopes built so far have struggled with many engineering issues. In terms of astronomy, we are thus about to go blind, returning to the days prior to the space age when our view of the heavens was fuzzy and out of focus. R.I.P. Nancy Roman, NASA’s first chief astronomer, died on Christmas at the age of 93. Her name is largely forgotten, but her support for building the Hubble Space Telescope in the 1960s and the 1970s was critical in getting it done. As important, her support for all in-space astronomy in these early years eventually made it possible. During her term NASA built and launched the first space telescopes. Some were duds. Some were incredible successes. Regardless, her leadership proved that astronomy in space made sense, leading to the achievements that have followed in the half century that has followed. The astronomy community is mourning the passing of Riccardo Giacconi, a pioneer in space X-ray astronomy as well as the first director of the Space Telescope Science Institute, which operates Hubble. What made him an especially interesting man is that he initially strongly opposed Hubble, preferring the money be spent on X-ray space telescopes. When, during the writing of The Universe in a Mirror, I asked him what prompted his change of opinion that made him head of Hubble, he explained that he felt he “wasn’t being used.” The money for X-ray astronomy just wasn’t there, and rather than chase rainbows he decided to hitch his wagon to something that was certain to produce new science. Giacconi was a unique and brilliant man. His early X-ray instruments were built by a private commercial company he ran, not a university or NASA. In a sense he was following the classic and older American model here that was abandoned in the 1970s, and is only now beginning to see a resurgence. Link here. It is the 25th anniversary this week of the space shuttle mission that installed the two cameras that fixed the mirror issue on the Hubble Space Telescope, and the press release at the link provides a nice short overview of that mission, and what was involved to make it happen. Of course, for a much more detailed look at this story, you could also buy and read A Universe in a Mirror. There are a lot of very fascinating stories that no single press release can possibly mention that I described with glee in writing this book. After three weeks of successful trouble-shooting of a backup gyroscope scientists have now returned the Hubble Space Telescope to full science operations. Everyone should understand that this situation is now very temporary. Hubble no longer has any backup gyroscopes. If another fails, they will have to go to a one-gyroscope mode, holding the second working gyroscope back as a back-up, in order to extend the telescope’s life as much as possilbe. In that mode the telescope can operate for a significant period, but will have limited capabilities. Engineers have apparently pinpointed and fixed the issue that was causing the Hubble Space Telescope’s last back up gyroscope to operate incorrectly, making it likely that the telescope will return to full normal operations shortly. This is wonderful news, in that it means the telescope will once again be able to point accurately enough to continue to take sharp images across the entire sky. It also highlights how close we are now to the telescope’s demise, since it no longer has a back-up gyroscope. With the next failure, which will occur eventually, Hubble will descend into one gyroscope operations, holding off its second working gyro as a backup. When it rains it pours: The Chandra X-ray Observatory went into into safe mode on October 10 for reasons that are either not yet understood or have not yet been revealed. Chandra, Spitzer, and Hubble are the three remaining of the original four great observatories proposed in the late 1980s, with the Compton Gamma-Ray Observatory the fourth. Compton was de-orbited in 2000. Spitzer’s infrared observational capabilities became limited when its cryogenic cooling gas became exhaused in 2009. Hubble and now Chandra are both in safe mode, leaving astronomy badly crippled. This situation is actually the fault of the astronomical community, which in the early 2000s put all its money behind the James Webb Space Telescope, leaving little for the construction of replacement space telescopes for either Hubble or Chandra. In addition, the astronomical community has continued to put is money behind similar big, expensive, and giant projects like Webb, pushing for WFIRST with its 2011 decadal survey. Like Webb, WFIRST will cost billions and take almost a decade to build and launch, assuming there are no delays. Meanwhile, the workhorses in orbit are failing one by one. NASA today released an update on the effort to bring the Hubble Space Telescope out of safe mode and back to full operation. The only new information they really provide is what they will do, depending on whether they can fix the back up gyroscope or not. If the team is successful in solving the problem, Hubble will return to normal, three-gyro operations. If it is not, the spacecraft will be configured for one-gyro operations, which will still provide excellent science well into the 2020s, enabling it to work alongside the James Webb Space Telescope and continue groundbreaking science. In other words, if they cannot find a way to get this third gyro functioning properly, they will shut down one of the two remaining working gyros so that it can operate as a backup, and operate the telescope on one gyroscope. I find the last section of the quote above very amusing, in a dark sort of way. Not only does NASA rationalize the sad loss of Hubble’s ability to take sharp images, it tries to rationalize the decade-long delays it has experienced building the James Webb Space Telescope. Webb was supposed to have been launched in 2011. It should have been up there already, working alongside Hubble for the past seven years. Now, the best we can hope for is that Webb will finally reach space while Hubble is still functioning, in a crippled condition. I would not be surprised however if Webb is further delayed, and Hubble is gone before it gets into space. The end might be near: The Hubble Space Telescope went into safe mode this weekend when one of its three working gyroscopes failed. Hubble has six gyroscopes, all of which were replaced by spacewalking astronauts during a servicing mission in May 2009. The telescope needs three working gyroscopes to “ensure optimal efficiency,” mission team members have written, and the failure brings that number down to two (if the “problematic” one that had been off can’t be brought back online). But that doesn’t mean it’s time to panic. Hubble can do good science with two gyroscopes, or even one, astrophysicist Grant Tremblay, of the Harvard-Smithsonian Center for Astrophysics, said via Twitter Sunday. While it is true that Hubble can do science on one or two gyroscopes, in that mode it will no longer be able to take the sharp spectacular pictures that represent its great glory. Hubble was launched in 1990, fixed in 1993, and has been the most successful science robot ever launched. Scientists had hoped, when they made the James Webb Space Telescope their priority in the very early 2000s that both would be in space and operating to provide top notch science data, with Hubble working in visible wavelengths and Webb in the infrared. Webb’s endless delays and cost overruns has now probably made that impossible. Worse, there are no plans to build a replacement for Hubble. For the first time since 1993, the human race will no longer be able to see, with our own eyes, the universe sharply. Cool movie time! Using the Hubble space telescope scientists have compiled an animation showing the changes in Saturn’s north pole aurora over time. In 2017, over a period of seven months, the NASA/ESA Hubble Space Telescope took images of auroras above Saturn’s north pole region using the Space Telescope Imaging Spectrograph. The observations were taken before and after the Saturnian northern summer solstice. These conditions provided the best achievable viewing of the northern auroral region for Hubble. …The images show a rich variety of emissions with highly variable localized features. The variability of the auroras is influenced by both the solar wind and the rapid rotation of Saturn, which lasts only about 11 hours. On top of this, the northern aurora displays two distinct peaks in brightness — at dawn and just before midnight. The latter peak, unreported before, seems specific to the interaction of the solar wind with the magnetosphere at Saturn’s solstice. Link here. It is almost twenty years since the Chandra X-Ray Observatory was launched, and in celebration the science team have released another X-ray image of the Crab Nebula, taken in 2017 in league with an optical image from the Hubble Space Telescope and an infrared image from the Spitzer Space Telescope. 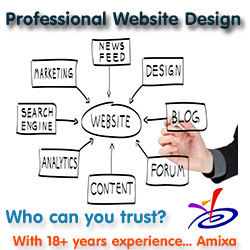 They have also provided links to all similar past images, going back to 1999. Some of the images are actually videos, in 2002 and 2011, showing the Crab’s dynamic nature. You can actually see flares and waves of radiation rippling out from its center. The uncertainty of science: Using data from the Hubble Space Telescope astronomers have found evidence that universe’s expansion rate is faster than estimated in previous measurements. The new findings show that eight Cepheid variables in our Milky Way galaxy are up to 10 times farther away than any previously analyzed star of this kind. Those Cepheids are more challenging to measure than others because they reside between 6,000 and 12,000 light-years from Earth. To handle that distance, the researchers developed a new scanning technique that allowed the Hubble Space Telescope to periodically measure a star’s position at a rate of 1,000 times per minute, thus increasing the accuracy of the stars’ true brightness and distance, according to the statement. However, the Planck data gives a constant about 9 percent lower than that of the new Hubble measurements, which estimate that the universe is expanding at 73 kilometers per second per megaparsec, therefore suggesting that galaxies are moving faster than expected, according to the statement. I should point out that one of the first big results from Hubble in 1995 (which also happened to be the subject one of my early published stories), the estimate then for the Hubble constant was 80 kilometers per second per megaparsec. At the time, the astronomers who did the research were very certain they had it right. Others have theorized that the number could be as low as 30 kilometers per second per megaparsec. What is important about this number is that it determines how long ago the Big Bang is thought to have occurred. Lower numbers mean it took place farther in the past. Higher numbers mean the universe is very young. That scientists keep getting different results only suggests to me that they simply do not yet have enough data to lock the number down firmly. Have astronomers using Kepler discovered the first exomoon? The uncertainty of science: Using data from Kepler astronomers think they have spotted the first exomoon, orbiting a star 4,000 light years away. They think it might be the size of Neptune, and orbits a planet about ten times more massive than Jupiter. All this is unconfirmed, however, especially because their conclusions are based on data from only three transits. They plan to use the Hubble Space Telescope to do more observations and hopefully confirm the discovery. Cool image time! By taking a quick series of thirteen images, the Hubble Space Telescope was able to shoot a short movie of the rotation of Phobos above the surface of Mars. The gif animation on the right is the smaller of the two animations released today. Be sure and view the full resolution version. Over the course of 22 minutes, Hubble took 13 separate exposures, allowing astronomers to create a time-lapse video showing the diminutive moon’s orbital path. The Hubble observations were intended to photograph Mars, and the moon’s cameo appearance was a bonus. In terms of science this movie has a somewhat limited value. In terms of space engineering it is triumph, and once again illustrates the unprecedented value of having an optical telescope in space. Woe to us all when Hubble finally dies, as we have no plans to replace it. Cool image time! 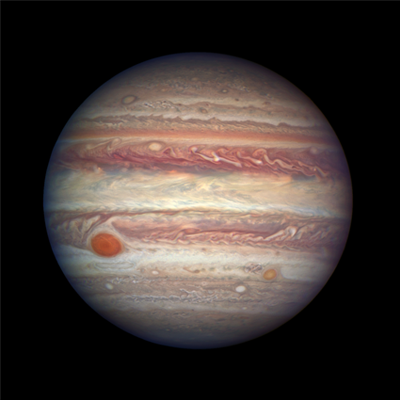 The Hubble Space Telescope has taken a magnificent global view of Jupiter. The image on the right is only a thumbnail. Make sure to go to the link to see the full image, which amazingly compares quite favorably with the images being sent down by Juno in orbit around the gas giant. This Hubble image once again demonstrates the remarkable advantages of an optical telescope in space. Equipped with the right instruments, it could do much of the research now being done by the planetary missions, and do it from Earth orbit.The research possibilities and the knowledge revealed from the ability to see things clearly in the optical bands is truly endless. Even more important, we are wired to what we see. Give us a good visual image and many questions can immediately be answered. Using the Hubble Space Telescope astronomers have taken a peek at the interstellar material that the two Voyager spacecraft will travel through as they move out and leave the solar system in the coming decades. For the next 10 years, the Voyagers will be making measurements of interstellar material, magnetic fields, and cosmic rays along their trajectories. Hubble complements the Voyagers’ observations by gazing at two sight lines along each spacecraft’s path to map interstellar structure along their star-bound routes. Each sight line stretches several light-years to nearby stars. Sampling the light from those stars, Hubble’s Space Telescope Imaging Spectrograph measured how interstellar material absorbed some of the starlight, leaving telltale spectral fingerprints. Hubble found that Voyager 2 will move out of the interstellar cloud that surrounds the solar system in a couple thousand years. The astronomers, based on Hubble data, predict that the spacecraft will spend 90,000 years in a second cloud before passing into a third interstellar cloud. This is very clever science. It allows data from Hubble to complement the data from the two Voyager spacecraft to better understand the interstellar regions that surround our solar system. Cool image time! The animation to the right, taken over three days by the Hubble Space Telescope, cropped and reduced to fit here, shows the debris flying away from Comet 332P/Ikeya-Murakami. It also shows a new piece of debris close to the comet on the lower left. Hubble’s sharp vision also spied a chunk of material close to the comet, which may be the first salvo of another outburst. The remnant from still another flare-up, which may have occurred in 2012, is also visible. 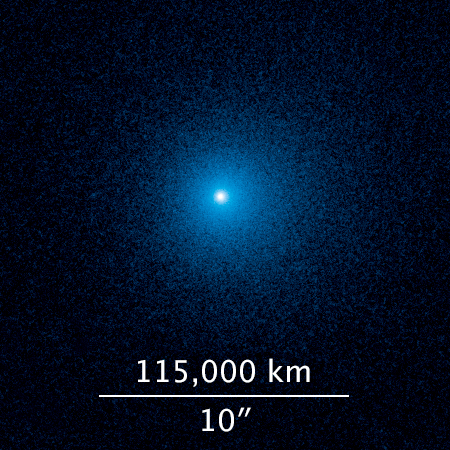 The fragment may be as large as Comet 332P, suggesting the comet split in two. But the icy remnant wasn’t spotted until Dec. 31, 2015, by the Pan-STARRS (Panoramic Survey Telescope and Rapid Response System) telescope in Hawaii, in work supported by the Near-Earth Object Observations program in NASA’s Planetary Defense Coordination Office. That discovery prompted Jewitt and colleagues to request Hubble time to look at the comet in detail. Around the same time, astronomers around the world began to notice a cloudy patch of material near the comet – which Hubble later resolved into the 25 pieces. NASA has extended its contract with Lockheed Martin for the operation of the Hubble Space Telescope until June 2021. This contract is for non-science operations. Science operations are controlled by the Space Telescope Science Institute in Baltimore. Note that when the last repair mission to Hubble took place in 2009, they expected it to add five years to the telescope’s life. This contract says they now expect it to last at least until 2021, which will also be 31 years after its launch and almost forty years since its actual construction. Not a bad track record when you think about it, especially since its original mission was set at 15 years, ending in 2005. Cool image time! Scientists have released a new Hubble Space Telescope image taken of the innermost regions of the Crab Nebula, the remains of a supernova explosion that took place a thousand years ago in 1054. On the right is a reduced resolution version of this new image. I have also cropped it to focus on the nebula’s center, where the pulsar is located. The circular concentric rings are exactly what they appear to be, ripples of energy spreading out from the pulsar. Back in 2002 Hubble took a series of images of the Crab Nebula over several days, which scientists then assembled into a movie showing these waves as they emanated out from the nebula’s center. My only complaint with this beautiful new image is that they did not take a longer series of new exposures to create a longer movie, to better show the actual daily changes that the nebula undergoes. It seemed obvious to do then, and obvious to do now. Yet, it hasn’t happened. The image download page for today’s release is here. Cool image time! In anticipation of the arrival of Juno in orbit around Jupiter on July 4, scientists have released a spectacular image of Jupiter and its aurora, taken by the Hubble Space Telescope. The image on the right has been reduced slightly to fit on the webpage. The main focus of the imaging is the aurora. 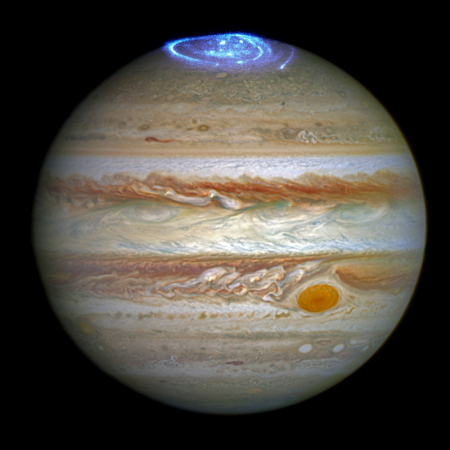 To highlight changes in the auroras, Hubble is observing Jupiter almost daily for several months. Using this series of far-ultraviolet images from Hubble’s Space Telescope Imaging Spectrograph, it is possible for scientists to create videos that demonstrate the movement of the vivid auroras, which cover areas bigger than the Earth. Not only are the auroras huge in size, they are also hundreds of times more energetic than auroras on Earth. And, unlike those on Earth, they never cease. While on Earth the most intense auroras are caused by solar storms — when charged particles rain down on the upper atmosphere, excite gases, and cause them to glow red, green, and purple — Jupiter has an additional source for its auroras. The strong magnetic field of the gas giant grabs charged particles from its surroundings. This includes not only the charged particles within the solar wind, but also the particles thrown into space by its orbiting moon Io, known for its numerous and large volcanos. I have embedded below the fold one of the videos of the aurora, taken over time by Hubble. Quite amazing. NASA has extended the contract with the Space Telescope Science Institute in Baltimore, Maryland to operate the Hubble Space Telescope for another five years, through 2021. Launched in 1990 and repaired for the first time in 1993, Hubble appears likely to operate for more than three decades, a stunning record for any spacecraft. The Hubble Space Telescope has imaged a developing new dark spot storm on Neptune. New images obtained on May 16, 2016, by NASA’s Hubble Space Telescope confirm the presence of a dark vortex in the atmosphere of Neptune. Though similar features were seen during the Voyager 2 flyby of Neptune in 1989 and by the Hubble Space Telescope in 1994, this vortex is the first one observed on Neptune in the 21st century. The discovery was announced on May 17, 2016, in a Central Bureau for Astronomical Telegrams (CBAT) electronic telegram by University of California at Berkeley research astronomer Mike Wong, who led the team that analyzed the Hubble data. Worlds without end: Hubble has spotted a small moon orbiting the distant Kuiper Belt object Makemake. The moon — provisionally designated S/2015 (136472) 1 and nicknamed MK 2 — is more than 1,300 times fainter than Makemake. MK 2 was seen approximately 13,000 miles from the dwarf planet, and its diameter is estimated to be 100 miles across. Makemake is 870 miles wide. The dwarf planet, discovered in 2005, is named for a creation deity of the Rapa Nui people of Easter Island. Using the Hubble Space Telescope astronomers have compiled a new set of maps of Jupiter, showing changes in the gas giant’s bands and spots, including the Giant Red Spot. The scientists behind the new images took pictures of Jupiter using Hubble’s Wide Field Camera 3 over a ten-hour period and have produced two maps of the entire planet from the observations. These maps make it possible to determine the speeds of Jupiter’s winds, to identify different phenomena in its atmosphere and to track changes in its most famous features. The new images confirm that the huge storm, which has raged on Jupiter’s surface for at least three hundred years, continues to shrink, but that it may not go out without a fight. The storm, known as the Great Red Spot, is seen here swirling at the centre of the image of the planet. It has been decreasing in size at a noticeably faster rate from year to year for some time. But now, the rate of shrinkage seems to be slowing again, even though the spot is still about 240 kilometres smaller than it was in 2014.